Mind Bytes from My world !!! : Cutting the 25th Bday cake for the 3rd time !! Cutting the 25th Bday cake for the 3rd time !! I guess they wanted me to realise deep down to grow more mature / responsible / less anxious and whatever that comes with growing older . 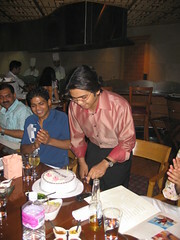 Anyways this is the pic of me cutting the cake at my Birthday Dinner with my close family and some freinds. Race to the TOP !!! Blogging on the Indian highway ! !